Houndstooth, as a textile design, is the pattern most famously associated with David Jones and its exclusive brands of chic styling. 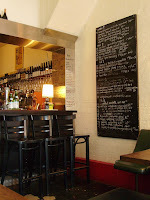 Its namesake in Fitzroy, however, eschews chic for cheap, but doesn't discount on style. Houndstooth is actually doing something a little different. It's a bit like being able to pick three curries and rice at a suburban takeaway, except here you're eating in, with bar on hand and some super-slick interior design (recessed chandeliers, cockroaches in silhouette on the wall), and you're selecting which dishes from a range of five 'courses' you want brought to your solid wood communal table. The courses on offer are starter, entree, main, dessert and cheese. Each has several options: taking one from each might result in nibbling on olives while you await spiced prawns; filling up on pumpkin bake with tahini and tarragon; finding space for chocolate cake; then knocking off a slice of chevre. The pricing couldn't be simpler: it's $15 for two courses, $20 for three and $25 for four. If you want more than you ordered, just hand over an extra five dollars while ordering at the bar. While there you might also ask for one of a huge range of bottled beers and ciders, or a glass from an intriguing wine list, stretching from a conventional Seppelt shiraz to a toothy Spanish sav blanc. It's liberating, whether you decide by price or appetite. And through the range we sampled, Houndstooth matches quality with value, serving up enough to keep you satisfied, and no more. A mushroom, water chestnut and ginger wonton (yes, singular - on menu and plate) dressed with mirin soy and chili probably takes less time to eat than it did to write up, but that's partly because it's so good. 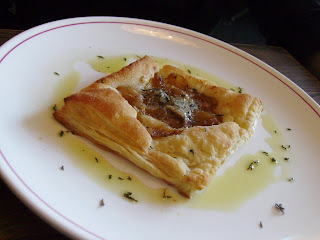 A gorgonzola and thyme caramelised onion tart was a little oilier than it needed to be, but exhibited a fine, pliant pastry and was softly satisfying all the same. 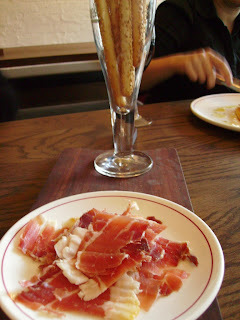 A plate of jamon delivers far more volume than expected. It's La Jabuguena - not the most expensive cut, but nor would one expect so. The thicker slicing, while not the ideal way to savour this fatty, cured meat, at least allowed the rare treat of eating jamon lavishly, rather than sparingly. A 'glass' of grissini served as bonus bread for the meal. The greatest raptures were reserved for a starter of scallops with spicy chorizo. Two molluscs proudly supported their thinly sliced, meaty coverings, and were bathed in a broth that demanded to be slurped from the shells. 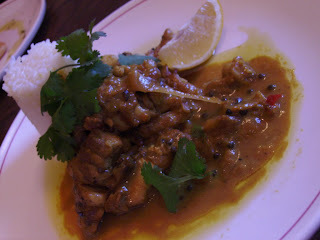 The only main we'd ordered was the fish curry, with tamarind, lemongrass, ginger, coriander and coconut. It was suitably zingy and refreshing, though the first bite was the least impressive, as it comprised mainly of tamarind seed - not an attractive flavour. Not being a regular fish curry eater, the softer meat texture took some getting used to. Despite the dish's small appearance, it proved more than ample. 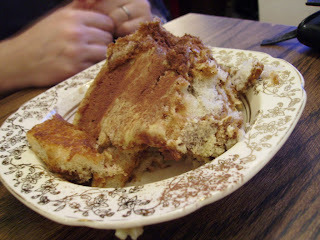 Three desserts graced the table: a tiramisu that, while enjoyable, was more sponge than savoiardi, and could have used some cream or marscarpone. Both the pecan and lemon tarts came with a fine vanilla cream. The latter was almost cheesecake dense, and not too sharp. It was satisfying to be in a venue that didn't conform to emerging inner-city dining trends. The Age's Dani Valent described the fare as that of 'a talented home cook hosting a dinner party two days shy of pay day'. It isn't top-shelf stuff, but there's enough of it; it's handled more aptly than most of us have skill for; and you know, undoubtedly, that you're getting the best that they could offer for the price. Make sure your plans are to head there after work, however: they're so anti-trend that opening hours are dinner, Monday to Friday, only. 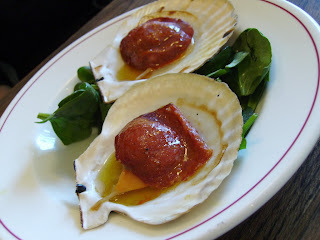 I could eat those scallops at every meal..
Houndstooth is one of Fitzroy's best restaurants. The food is exceptional for the price! Read the Fitzroyalty review of Houndstooth. Fitz, you're so right. I enjoyed your review as well.